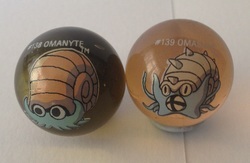 Welcome to one of my dearest and biggest collections, Omanyte and Omastar! These cute little fossils are pretty under-merched, but there's still a lot out there for me to get. Oh blimey, this thing! 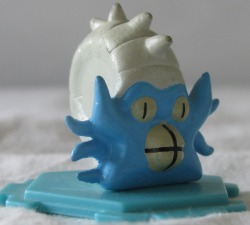 I started collecting Omanyte and Omastar one day, and saw the zukan and fell in love. However, it was way out of my price-range, so I put it down as a grail and pretended I'd never find it. Three days later, I saw it in a sales post on the day I was paid. I snapped it up, and gosh, I'm so glad I did! I haven't seen one since, and it's beautiful! 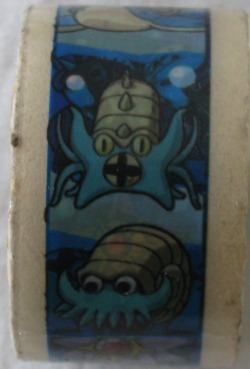 This tape came from a friend on LJ called killerjaw01, and features Goldeen, Seaking, Magikarp, Gyarados, Omanyte and Omastar on a blue, watery background. This was an item I didn't even know existed, so getting it was a huge surprise! These were drawn and manufactured by the very talented silversnowcloak @ LJ. 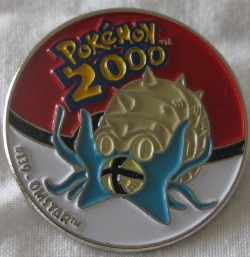 They feature the shiny versions of both Omanyte and Omastar, and Omastar has a little purple crystal on his shell. This photo doesn't do them justice; they're absolutely stunning! 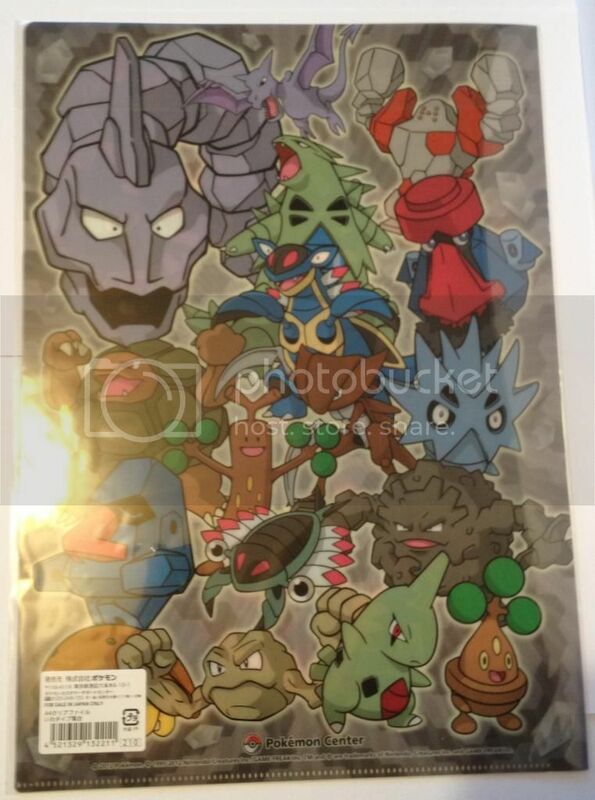 These come from a set which came out during the Generation 1 run of merchandise, and all the first 151 pokémon have marbles in various colours. 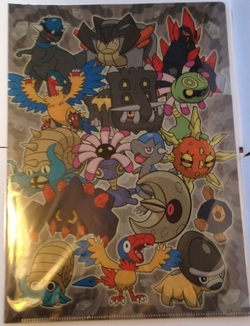 These are little tiny charms from the promotion in 2012, where every single pokémon got a charm. 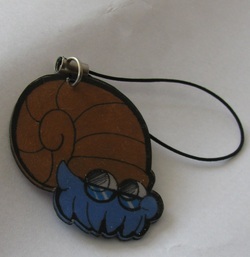 They're enamel on metal, and very cute. 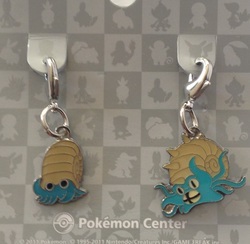 The first new Omanyte/Omastar merch since charmaggedon! SO AWESOME! You can see the back here. Olyre is the name of this little guy! He was made by starlighteevee @ LJ, and is made of super-soft fleece. He's in a pokédoll style, and is about 8-inches long. He's the pride of my collection, and I love him heaps and heaps! 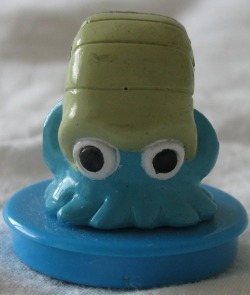 This is the Omanyte Jakks Figure, better known as CREEPY in my household because of his scary eyes! As far as I know, they were sold in packs of three with a Wooper and a Pichu figure in the USA. 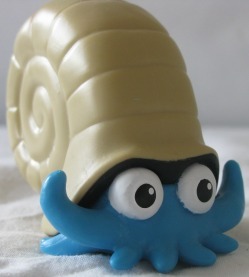 As the title says, this is the Omanyte TOMY figure. 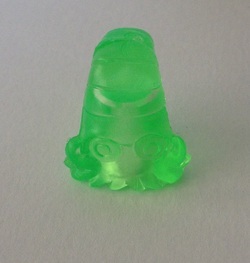 He stands about an inch tall, and is super cute! 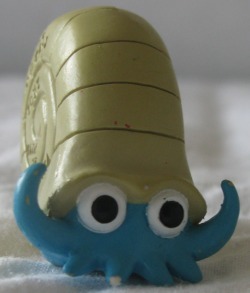 This is the Omanyte Kids figure, and he's hollow plastic and around an inch and a half tall. 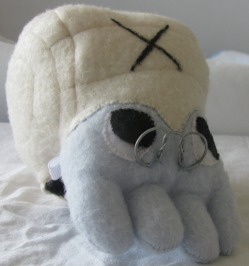 He's very cute, though Omanyte does suffer with Same-Pose-Syndrome! 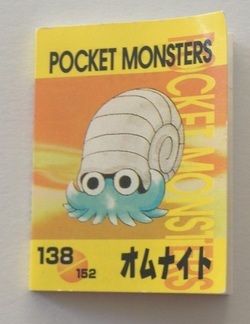 The day after I started collecting Omanyte, I found one of these in a GA. It was sadly lost, and this became the pattern of GA's in which this little dude was found. But I got him in a sales post recently! YAY! He's just gorgeous; I love him! They're called megablocks, but blimey, they're tiny! This little guy is about half an inch tall, and is just so adorable! I saw him in someone's collection post and lamented that I'd love him, and another user came along and offered me him. 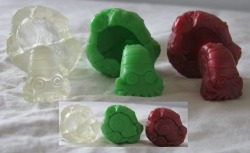 These are small, less than an inch tall, models which come on interlocking hexagonal bases. They come in a variety of poses and can be clear, but these two are just standard FCS. Twin Omanytes, what could be better? 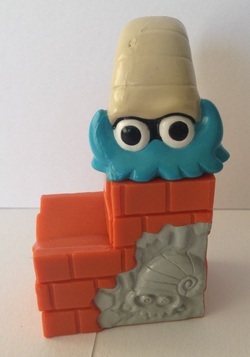 This miniscule figure is smaller than the megablock, and is painted in pastel colours. 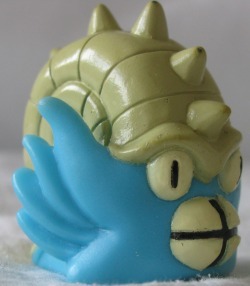 He seems to be the same mould as the keshipoke pictures further down, but his actual origin is completely unknown. These are one of my favourite items! 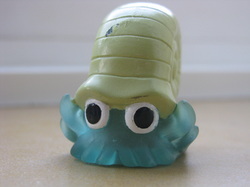 They are made of a soft rubber, and come in a rainbow of colours, but that's not my favourite part - the Omanyte ones actually come with a rock-shaped piece, so when they're inside they look like Helix Fossils. Utterly awesome! I'm always looking out for these, if you have any for sale. I love these things, but this one is sadly incomplete. 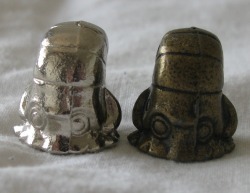 These are solid metal models of Omanyte, which stand around a quarter of an inch tall. They are super rare, as I think they came boxed in blind packs when Pokémon first came out in Japan, and are surprisingly heavy for their size! This is from the 151 series of stamps, which are made from tough red rubber and can feature any of the original 151 Pokémon from Kanto. I'm still hunting an Omastar down, though! 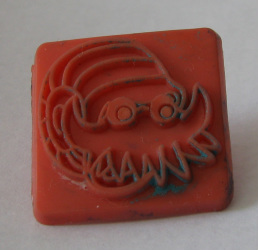 This is a chibi stamper, so called because the figure on top of the stamp is in a chibified style. 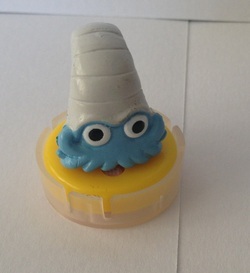 He stamps in blue, though his stamp is now dry, and is occasionally used to stamp my parcels from my LJ shop. I have no idea what he is! He's stamped 1997, but other than that, who knows! 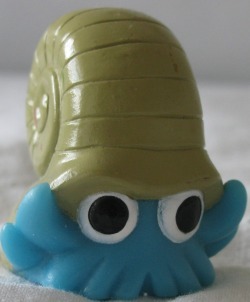 He is considerably darker than my other Omanytes; maybe he's an early playse figure? I love this pin! He was a lucky purchase from a friend on Twitter; 151 Pins were produced when Pokémon was brand new, to give you an idea of his age! 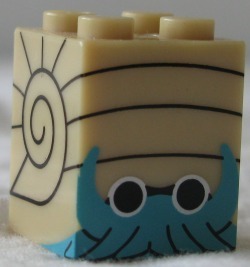 This is a self-inking stamp of Omanyte, with a chute chibi figure on the top! I'm always looking out for alternate colours of these; there are quite a few. I have very little information on this guy. He's quite a good size, roughly the same as the TOMY figure, and comes with a section of wall for a base. Very odd, but very cool. This is a tiny notebook, with lined paper inside. These are made from real snail shells, carefully cleaned and then pained and decorated! 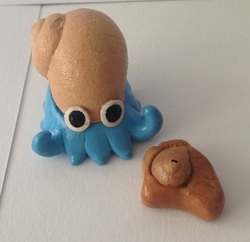 They are by captainangel, as the charm below is. This little cutie came as part of a trade with the hugely talented captainangel! 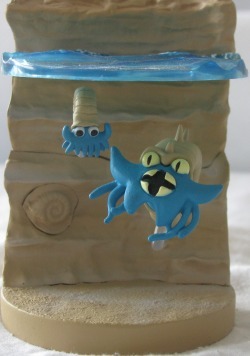 As the title suggests, this image shows the Omastar TOMY figure. 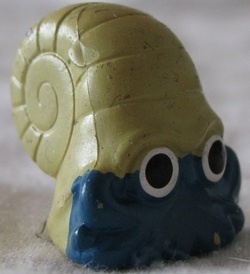 He was actually my first fossil TOMY, and I was very pleased to find him in such good condition in a lot on eBay. 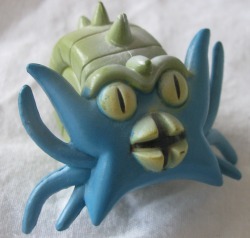 This is the Omastar Kids figure, who I got from a seller on LJ. 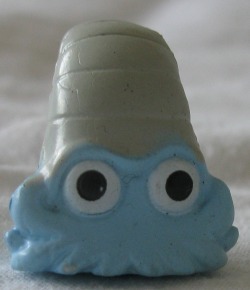 He's in remarkable condition and, similarly to the Omanyte figure above, is hollow and about 2 inches tall. 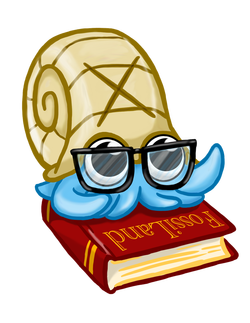 He's such a badass snail, don't you think? This pin is about half an inch in diameter and is enamelled, so it's really bright. 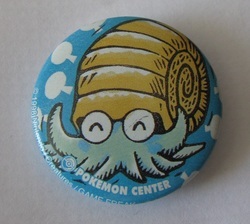 I'm hunting for an Omanyte version, though I'm not 100% sure one exists - time will tell! This is one heck of a puzzle. His base is bigger than a normal FCS, he is bigger and in a different pose to a FCS, yet the layout is the same. I was very puzzled by him, and so he's been dubbed a DX FCS until I work out what he is! 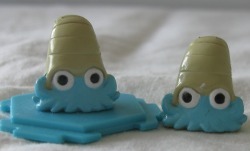 As with the Omanyte ones, these are about half an inch tall and made of a soft, rubbery material. They come in a rainbow of colours, so if you have some for sale, do let me know! I love this little guy! He's bright green and has affectionally been named Booger in my house. 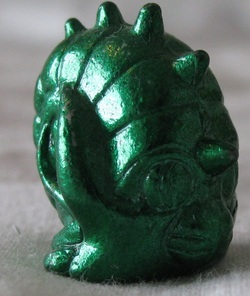 Similarly to the Omanyte keshipokes, he's about quarter of an inch tall and made of solid metal. Very cute, tiny and heavy! 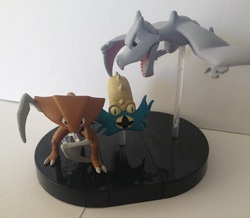 FCS figures were made of the original 151 Pokémon, and come in a variety of poses - normal, clear and attack (similar to Kids figures). 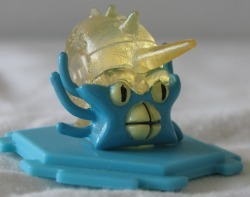 This is the clear Omastar FCS, and I'm still hunting for a normal one. Oh man. This is the most awesome zukan ever. I absolutely love it - it's my favourite item out of all my fossils. So detailed, and unusual poses too. Absolutely amazing.